I must admit I was expecting a much funnier book from Helen Razor and Bernard Keane given Helen's background in comedy and Bernard's background in politics (how can anyone write about politics seriously?). Their book, A Short History of Stupid, The Decline of Reason and Why Public Debate Makes Us Want to Scream, is a collection of essays that serve as a reality check for life with an awareness that we're all being manipulated by spin to varying degrees. For me it finally answers the question of why TV news desks cross live to a reporter who is standing nowhere of significance to the report they are about to give. Apparently it's to give the daily news report that feeling of 'things are happening now' in a world where you can follow what's happening now live on the internet. It's a desperate attempt to say TV news reports are still relevant and current - even if the live cross is actually meaningless. On the whole this was a very good read that puts the spotlight, mostly on recent public debates that you more than likely be familiar with, and looks behind the spin to not only look at the facts but also some of the consequences of following 'Stupid'. Personally I found the first chapter, L'Oréal and the fade-resistant rise of liberal individualism, which attempts to track some kind of history of stupid from dead philosopher, John Locke, to actress, Heather Locklear a tedious and almost off putting read. Largely because it explores the kind of knowledge and book reading that only university philosophy students and people who have an obsessive desire to sound smarter have to endure. Dead philosophers are hard to relate to outside of Monty Python songs. I feel the chapter was put in to give the rest of the book more authority. A 'look we're smarter than you' when it comes to this subject matter. (As far as I'm concerned both authors are more well read than me but just because Helen Razor has longed to slap Heather Locklear's face doesn't mean she needs to take it out on me with how well read she is). Unless philosophy is something you've studied, power through that chapter. I wouldn't skip it but just know the rest of the book is much more relate-able and covers many things they may even be on your radar such as religion, politics, the war on terror, global warming, eating healthy, media, Kony and more. Everything is put under the microscope to see if what we're being told is actually accurate and/or effective in achieving the desired outcomes (usually not since the book is an examination of 'stupid'). The book does try to inject some humor into the discussion but there was nothing laugh out loud funny. If anything the humor is more cynical which is entirely appropriate. Cynicism about anything at least makes you think about what you're being told. If this book has a message it is simply that: Think. Think for yourself and, perhaps, re-engage in facts rather than opinion. You'll learn that much stupid occurs because opinion replaces actual facts as truth, personal stories are used to represent the mass experience even if those stories actually represent the minority and that data can be skewed to the desired outcome for political purposes rather than representing anything based in reality. Consider this book a look behind the curtain on modern public debate and why it's going off the rails in nearly every forum. 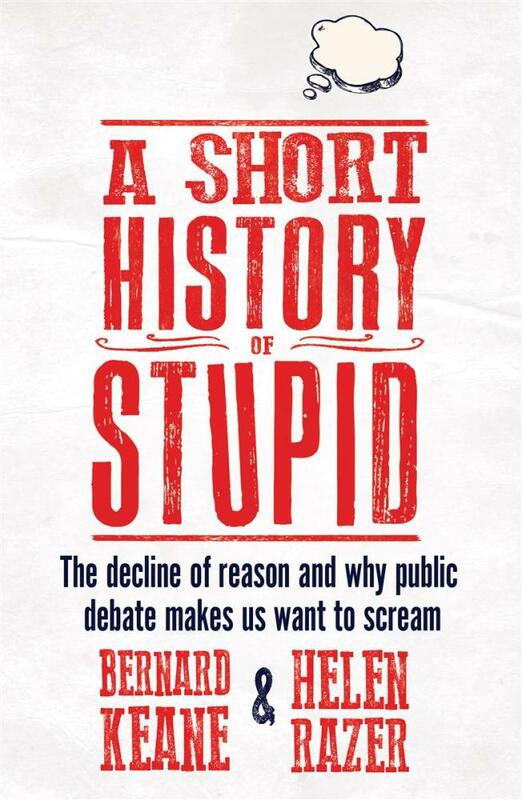 If you find yourself in many public debates or are a keen observer of public discourse then this book may open your eyes to the hidden stupid that you probably know is there but just can't articulate.